Brown Bear ammo has been around for decades and has made its mark in the world of firearms. 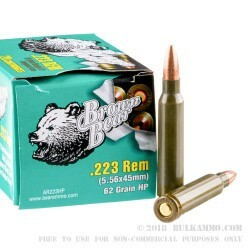 The Bear line of ammunition is usually one of the first choices when it comes to value priced rounds. 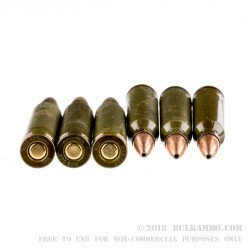 When you need high quality loads, but you also want to stock your armory as full as you can get it, the Bear ammo line from Barnaul is the optimal choice. 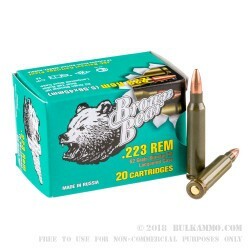 These Brown Bear rounds have heavy walled, non-reloadable, lacquer coated steel cases with non-corrosive, Berdan primers. Loaded into these tough as nails steel cases are 62 grain copper jacketed hollow point .223 Remington bullets. These are easily some of the fastest steel cased .223 Remington loads on the market with their 3050 feet per second muzzle velocity. As if that wasn’t impressive enough, they also have a smashing muzzle energy of 1281 foot pounds. These rounds travel faster and hit harder than many other loads currently out there. This ammo comes ready to go in twenty-five, 20 round packages. 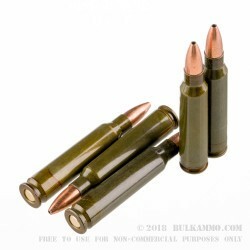 With a bulk pack of 500 of these .223 rounds, you will have plenty of ammo for at least a few days, depending on how long you spend at the range each day. Get yourself a few cases so you’re ready when you want to go out plinking, or any day your family or friends want to go see your new firearms in action.